Dermatographism | Dermatographic Urticaria | What Is Dermographism (Skin Writing Disease)? What is Dermographism (Dermatographic Urticaria)? Dermographism is a condition in which people will experience a wheal reaction after the skin is rubbed or touched in a way that produces a response. In some people, the reaction can burn, sting, and even itch. For others, it may not hurt at all, and only provides a cosmetic embarrassment. For many people with Dermatographia, simply rubbing a coin, or stroking a pencil (or other sharp object) along the skin will result in a “wheal” reaction. The person’s skin is otherwise healthy and normal in appearance, and shows no symptoms unless it has been stimulated with a blunt or sharp object. However, once the skin is rubbed or touched in a way that causes a reaction, the wheals can appear as pictured below. Dermographism pictures and images like the one below show how the skin forms a wheal on its surface after being stroked or rubbed with a rigid object. Notice how the letters and numbers are very distinct, which is where the term “skin writing disease” get’s its name. People with this condition often write on their skin just to observe the reaction. Some have even created stunning displays on their own skin, and then sold them as art (see below). Dermatographism Causes: What Causes Dermographism? Once histamine is released, it reacts with the tissues in the areas surrounding. This is what causes the raised wheals, and may also cause other discomfort such as itching, burning sensation, flushing of the skin, or small hives. How Long Does a Dermatographic Urticaria Reaction Last? 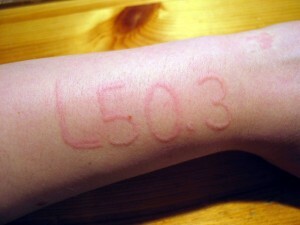 Typically, dermatographic urticaria reactions last between 15-30 minutes before the swelling and wheals disappear. A person with this type of physical hives can literally cause a reaction at any time by simply rubbing the skin with a sharp object (such as a pen, fingernail, butter knife, etc.). Rarely, the dermatographia may last for several hours. The condition itself can go into remission, but for others it may be a life-long ailment. There does not seem to be any evidence that it is connected with any cancers, nor has any evidence been shown that it can shorten life spans significantly. Doctors often diagnose dermatographic urticaria by stroking the patients skin with blunt object, and then observing the reaction. If a strong wheal is produced by the rubbing action, the patient may be diagnosed as having the skin disorder. Dermatographic tests are often given to people with allergies or other physical urticaria disorders, as sometimes people can have multiple hives or allergic conditions concurrently. Dermatographic urticaria treatments are often similar to other type of physical urticarias. Antihistamines are often used to control the itching and whealing, and in more severe cases, 2 different types of antihistamines (H1 and H2) may be used to control symptoms. People with this condition may also find it helpful to use hypoallergenic laundry, soaps, shampoos, and skin care products. Avoiding abrasive fabrics, such as wool, may also be helpful. Keeping fingernails trimmed to avoid excessive skin stimulation when scratching may also be useful. Physical urticarias are sometimes helped by modifications in diet, such as in cases of exercise induces anaphylaxis, and other physical hives. Some urticarias can be helped by UV therapy, although this may not be ideal for every subtype. For mild cases, some people may not seek treatment at all. This is especially true for patients which do not exhibit itching, stinging, or other uncomfortable responses. In an episode of the show “Medical Mysteries,” they featured a woman with dermatographic urticaria. This woman could simply take a pin or sharp object, draw a pattern or write something on her skin, and magically it would appear in a very distinct pattern. She said the reaction didn’t hurt, itch, or burn. “It just happens,” she said. She was always interested in art, and wondered what it would be like if she drew a pattern on her skin. She soon discovered that she could draw a pattern, and then the wheals would appear soon after. The reaction would last about 30 minutes. Fascinated by the reaction, she started drawing intricate artistic patterns on her body. She would then wait for the skin reaction to occur, and when the wheals appeared, she would grab her camera and snap a picture of it. She then started to display these pictures at art shows. She has since been featured in many art magazines and articles. She has also been able to successfully sell this artwork, for as high as almost $4,500! Wow, that was an incredible and fascinating story! I guess that is one great example of the saying, “If life hands you a lemon, make lemonade.” She turned a bad condition into a lucrative profit. There a few similarities between dermographic urticaria and other types of hives. First, people with dermatographic urticaria (DC) only experience a response when the skin is stimulated in a way that causes a reaction. Another similarity is that (DC) reactions typically last about 15-30 minutes. That is how long other types of phyisical urticarias last. People with dermographia also sometimes experience a remission of symptoms, as do people with CU. Also, neither condition seems to be life threatening in most cases (with the exception of possible anaphylactic shock).